This past weekend has been one of celebration as it was Durga Puja. 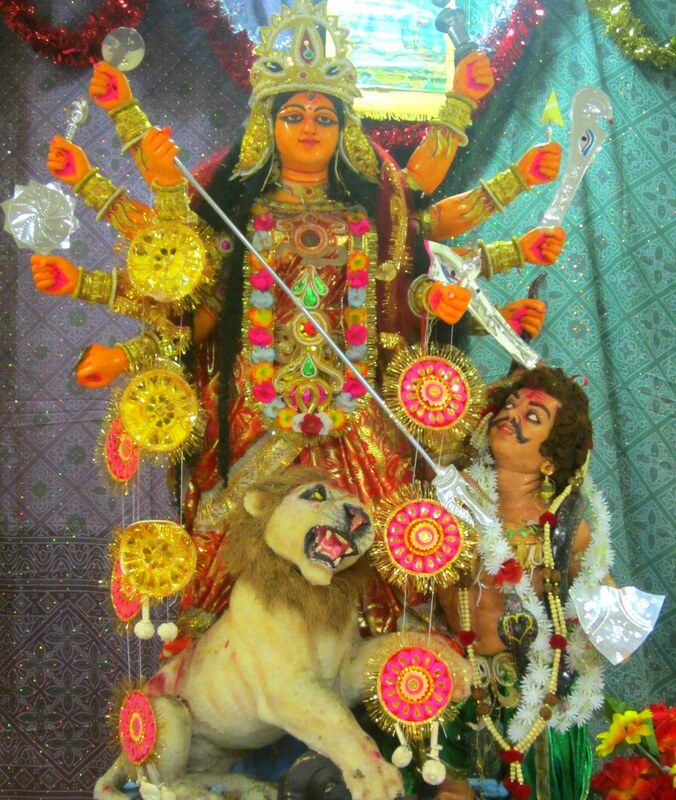 For Bengali Hindus (my husband’s side of the family) Durga Puja is the biggest religious festival in the Hindu calender. 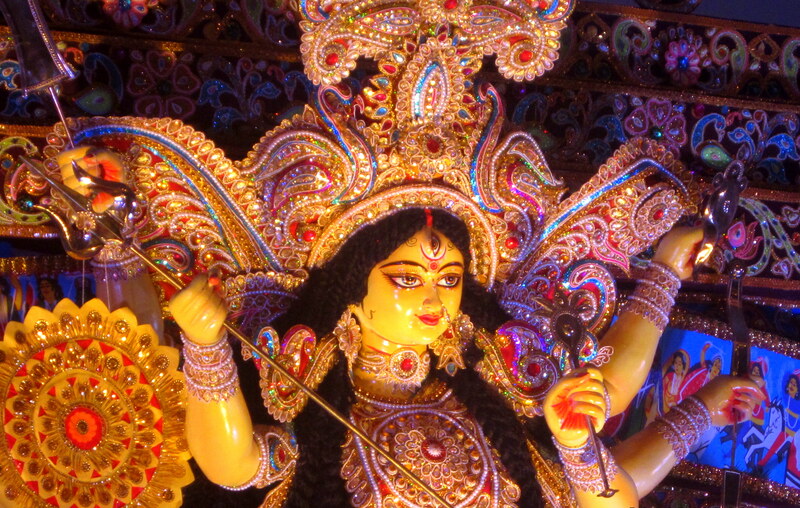 In Kolkata, which is the heart of Bengal, I am told it is taken to another level altogether, when families feast, dance and pray to the goddess Durga – the conquerer of good over evil and the mother of the universe, as well as her children: Ganesh, Saraswati, Lakshmi and Kartik. Schools close and everyone takes time off work to celebrate. The making of the statues is a hugely lucrative business in India and at the end of the six day festival the statues are ceremoniously carried to the Ganges and left to drift away and be reabsorbed into the Ganges. The statutes themselves are made of straw and mud from the Ganges and then glazed with paint to give them that glossy shine; the craftsmanship and detail never ceases to impress me. 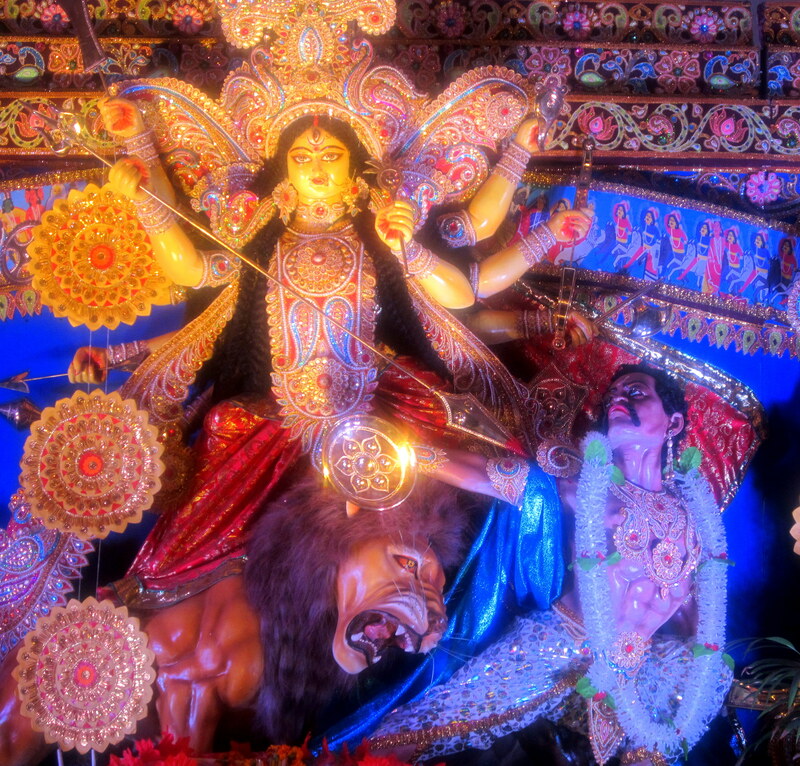 There are thousands of Durga Puja pandals, which are basically huge structures housing the goddess and her children, erected all over the different Kolkata neighbourhoods. 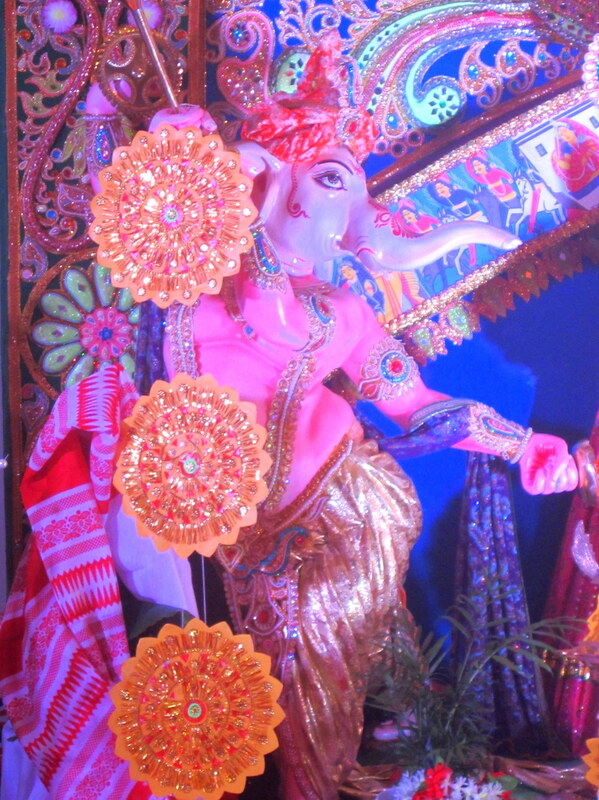 It’s all hugely competitive and each pandal competes for attention in beauty and innovation. I visited two different ones in London – one in Tooting and the other in Hounslow and both were very spectacular in terms of colour and design, the latter I know had been shipped from Kolkata. The banging of the drums, the blowing of the conch shell, the incense, the chanting of the prays and hustle and bustle of people coming and going really transports you to India. It’s all rather frenetic and yet very warm and inviting at the same time. In the Hounslow pandal alone thousands of visitors came and went over the course of a few days. Catering for that number must be rather daunting but I was very impressed by the taste and quality of the food and the fact that it was all hot. 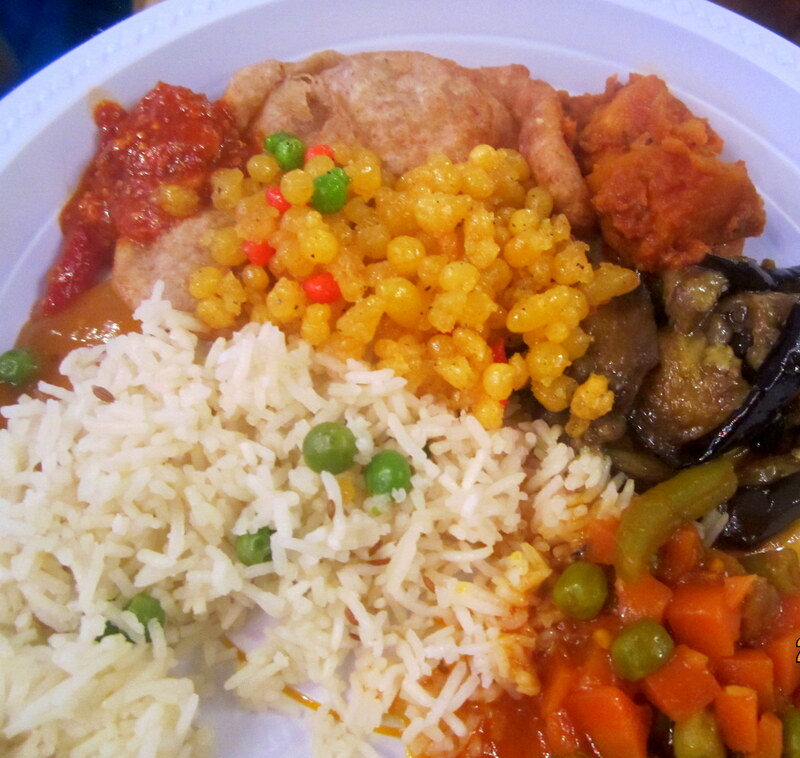 It was the longest queue for food I have ever witnessed, but it moved quickly and before long we were given a plate of tasty vegetarian food. Back at home I have been cooking an endless amount of Indian dishes from: methi and pomegranate pork curry to amma’s chicken curry, red lentil dal with spinach, yellow dal with courgette, Bengali fish curry and mung bean and cumin dal. 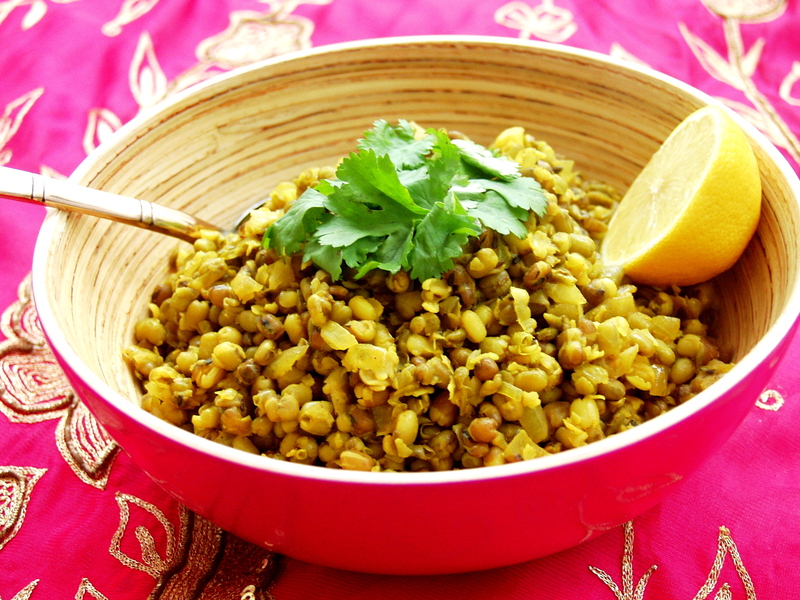 It is the mung bean dal recipe that I wanted to share with you all today. Unlike red split lentil and some yellow dal it does require a little more forward planning as it needs to be soaked, ideally overnight. It’s delicious, nutritious, cheap to make and other than the soaking of the mung beans, is very straightforward. 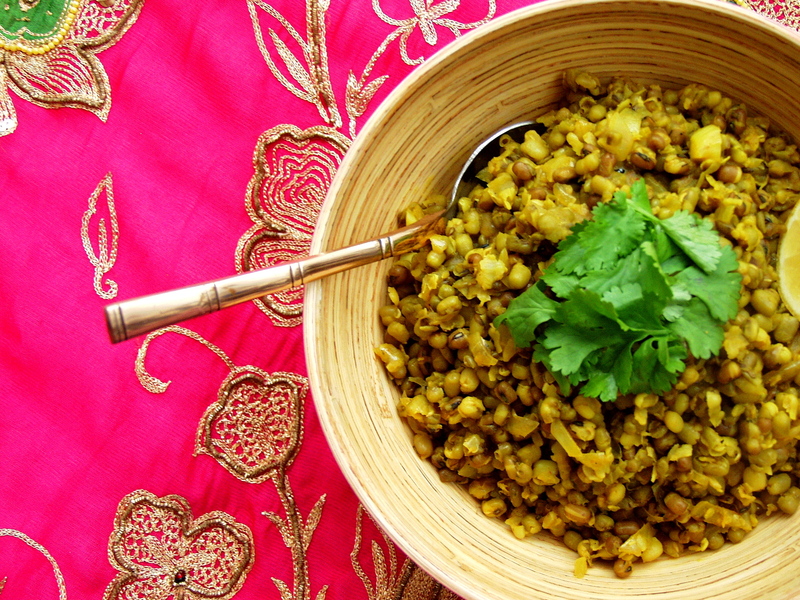 My mother-in-law makes a completely different tasting mung bean dal, which I will post another time, but to get you started try this one and let me know how you get on. It’s perfect for a week night vegetarian supper. 1. 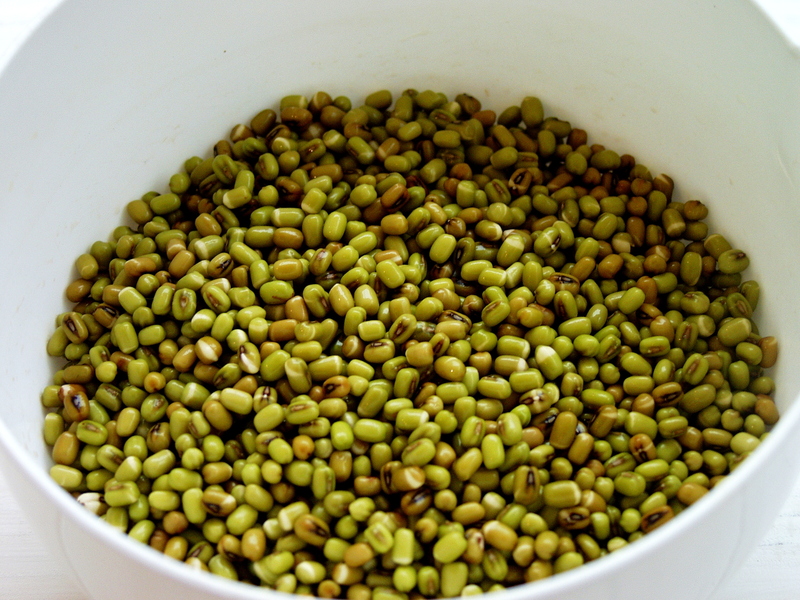 Place the pre soaked mung beans in a pan and cover with water and gently simmer until softened. This will take around 40 minutes. 2. Meanwhile, place the oil in a pan and gently fry the cumin seeds for a minute or so until they begin to bronze. 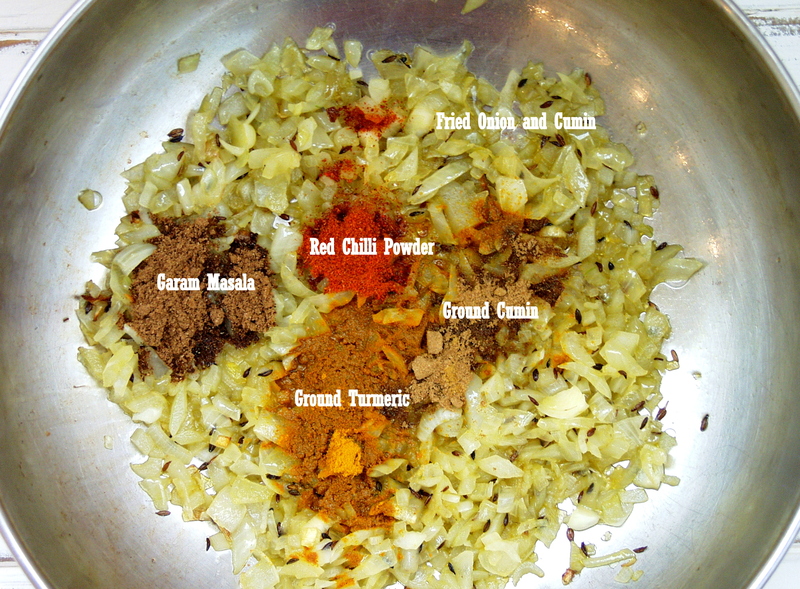 Immediately add the onion and mix together with the cumin seeds. 3. When the onions have softened and become translucent add the cumin powder, red chilli powder, turmeric and garam masala and stir together. 4. Drain the mung beans and then transfer them to the pan with the onions and fold in thoroughly. Add the salt and lemon juice and simmer together for a further 5-10 minutes. You may need to add a little more water at this stage. Whilst it is delicious to eat on its own or with a chapati it is also great to accompany it with a fish, meat or vegetarian curry (see my recipe library) if you wish to make a more substantial Indian feast. This entry was posted in Away Days, Dal, Vegetarian and tagged cumin powder, cumin seeds, curry, dahl, dal, durga puja, garam masala, Hounslow, lemon, moong beans, mung beans, pandal, red chilli powder, Tooting, turmeric, vegetarian. Bookmark the permalink. I do fast during Navratri but now it have become the tough part for me as I have to take the coverage of Durga Puja pandals in North Bengal . Being the admin of BengalFestival.com, I’ve to do lot of work during all biggest festival of North Bengal from collecting the images, data and then arranging and posting them on our portal. Although I enjoy it a lot.